The Gamecocks went to Charlotte tonight to take on a very highly favored NC State team who has had some very impressive wins this season. Things got out to a bad start for the Gamecocks in the top of the first going down 4-0. The bottom of the first gave the Gamecocks the offensive jolt they needed to turn their fortunes around. In the bottom of the first inning the Gamecock offense got off to a hot start driving in seven runs to start the game. This wave of offense helped light a fire under the pitchers who played extraordinarily well after giving up four runs in the first inning. Outside the first inning the Gamecocks only allowed four runs. Other than the first inning TJ Shook threw some great baseballs. As the game wore on the Wolfpack crept back into the game and eventually tied it up on a two error defensive play from TJ Hopkins and Chris Cullen in the bottom of the eighth. The play gave up two runs but Wesley Sweatt cleaned up the inning to prevent the Wolfpack from taking the lead. As the Gamecocks took the plate Noah Cambell hit a rocket down the center of the field with the bases loaded that looked like it was going to drive some runs in. However, NC State’s second baseman made an incredible play on the ball that ended the eighth inning. Wesley Sweatt pitched an outstanding ninth inning preventing the Wolfpack from even setting foot on base; smothering any hopes of any ninth inning dagger balls. 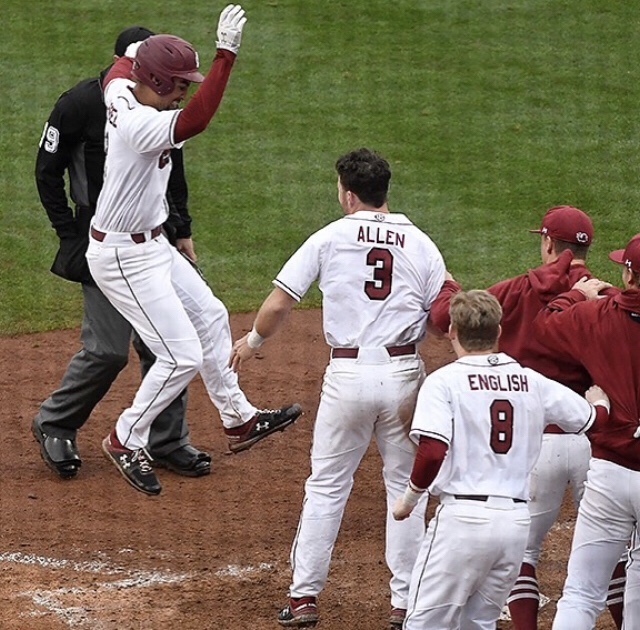 As the Gamecocks got to the plate they had a chance to walk off the upset win against one of the top five teams in the country, and that is exactly what happened. With a runner on third Jacob Olson absolutely cranked a ball out to left center field that landed on the roof of a picnic table well past the wall. This smack drove in two runs for the Gamecocks and secured the 10-8 upset victory over the Wolfpack. Hopefully this win will light a fire under the boys and get the bats active again. The past two weeks have been pretty tough to watch both offensively and defensively. We still need another weekend pitcher to step up if we want to turn the corner and get back on track. Hopefully we can get a convincing sweep in Tuscaloosa this week to right the ship and try to sneak into postseason play.